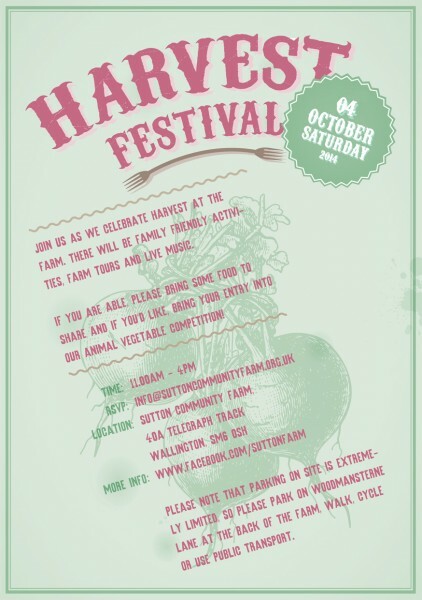 Join us for our annual Harvest Festival on Saturday 4th October 11.00am-4pm. This is our annual open day where we celebrate the growing season. There will be family friendly activities, farm tours, music and of course, delicious food! Plus, we’ve a special treat this year — one of the Hix Restaurant group’s top chef’s Kevin Gratton will be coming along to give a cooking demonstration with some of our freshly harvested vegetables. Our Harvest Festival is a great chance to meet the farm team and all the wonderful volunteers that make the farm happen. We are having an animal vegetable competition! Get your creative juices going, and turn your vegetables into animals for a chance to win a prize. Our Farm is small and we can’t cater for many people. Please RSVP by emailing us info@suttoncommunityfarm.org.uk or joining the event on Facebook. Please bring some food and drinks to share if you can. Wellies and instruments all welcome. Please get in touch if you have any special requirements. Parking is very limited so best to let us know if you are bringing a car so we can be sure there’s space. From central London, you can get to the farm in under an hour. If you are local, we are located by Woodcote Nursaries. Most first time visitors get lost! Click here for directions to the farm. If you are driving, please park on Woodmansterne Lane and enter through the farm gate, or opposite in Flittons Nursery.